Oaks in southern California have been confusing to many people, especially botanists, for many years. 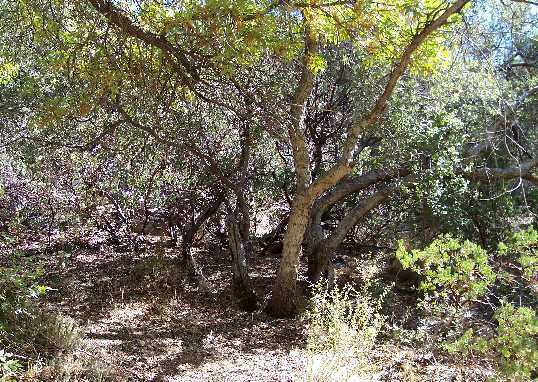 The successful delineation of species for our scrub oaks here did not occur until 1981 through 1994. The breakthrough was achieved by looking at the trichomes (hairs) on the underneath of the leaves, especially for the white oaks. The trichomes in many cases shout out the species of a given specimen that had only been whispered, or even hidden, by the leaves and acorns. 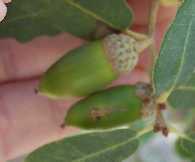 For more on this interesting story, including dates when our species were recognized, see Scrub Oaks. 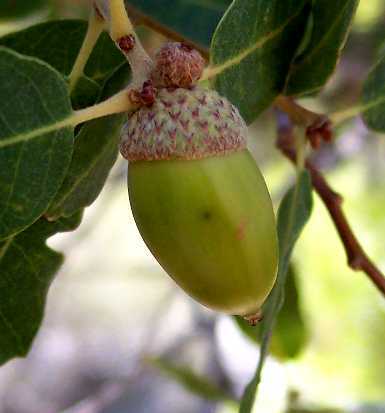 It is little recognized that scrub oaks can sometimes be arborescent. Quercus cornelius-mulleri, seen almost always as a shrub, can sometimes be arborescent, usually with multiple trunks, but sometimes with a single trunk (Roberts 1995). Its close relative, Q. acutidens, is well known to come in both shrub and tree forms. In fact, the Jepson Manual keys Q. acutidens separately under both tree and shrub forms (Tucker 1993). 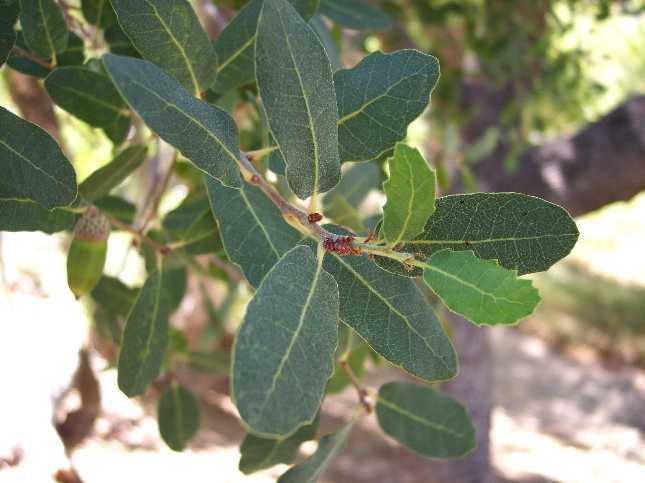 Q. acutidens is a widespread taxon in southern California, and a significant population is found in the Santa Rosa Mountains less than eight miles away from this "Quercus engelmannii". 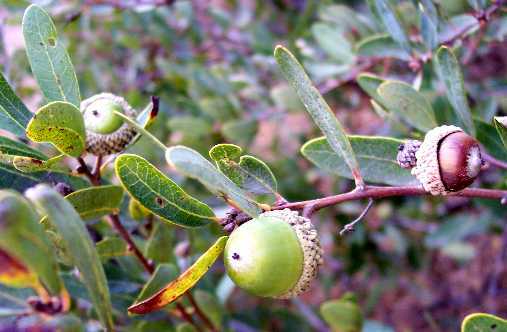 Oddly, though, despite its presence in the Jepson Manual, Q. acutidens itself is little recognized; most botanists sweep it, and often all the other scrub oak species, into the Q. berberidifolia tag. Q. acutidens is thought to be a species of ancient hybrid origin between Q. cornelius-mulleri and Q. engelmannii. This hypothesis seems quite reasonable, since roughly half of all Q. acutidens specimens throughout southern California exhibit trichomes of Q. engelmannii in addition to the trichomes of Q. cornelius-mulleri present in all Q. acutidens specimens. 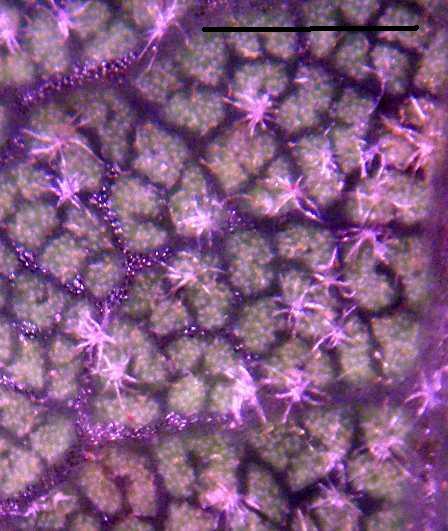 In addition, many specimens of Q. acutidens have leaves that greatly resemble those of Q. engelmannii in shape, but with no correlation to the presence or absence of Q. engelmannii trichomes on the leaves. This indicates that the genome inherited from its parents has stabilized as a separate species. An arborescent specimen of Q. acutidens in Horsethief Creek, next to the Cactus Springs Trail, has been of much interest to botanists. This single tree has been vouchered three separate times, in 1975, 1978 and 1988, by three separate botanists, and each time determined as Q. engelmannii! Interestingly, this single tree is accompanied by two arborescent specimens of Q. cornelius-mulleri, which have apparently gone unnoticed. If a specimen of Q. engelmannii, whose range is in the coastal foothills of the southern California mountains, truly occurred in this location, it would be a significant range extension. The closest specimen of Q. engelmannii is ~30 miles away, which is considerably more than the entire east-west width of the Q. engelmannii distribution. So when Scott White brought this specimen to my attention, I immediately was suspicious of the identification, and on 17 October 2006 went to check it out. The black rectangle outlines the tree, which extends to just below the top of the picture and has a single trunk. There are two similar specimens nearby the tree, both of which are clearly Q. cornelius-mulleri despite their tree-like appearance. These specimens are the "arborescent-shrub" form of Q. cornelius-mulleri with multiple tree-like trunks. The presence of year-round water in Horsethief Creek is probably responsible for these arborescent forms of both Q. acutidens and Q. cornelius-mulleri. 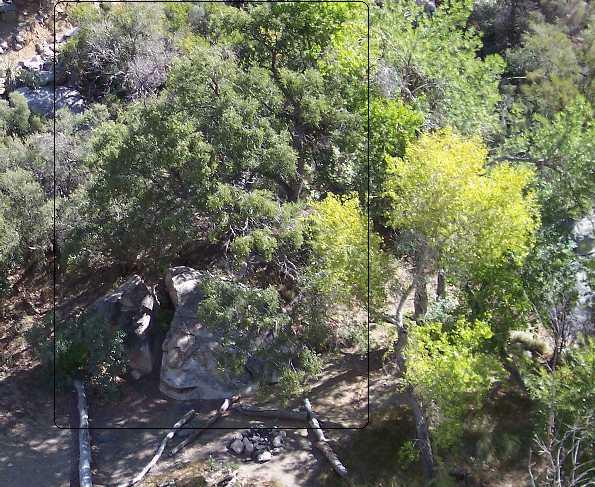 This panorama is taken from down in Horsethief Creek; the same large split boulder is present in both photos. The Q. acutidens tree in question is #1, labeled on its trunk; the Q. cornelius-mulleri specimen #2 is labeled to the left side of its trunks; and the Q. cornelius-mulleri specimen #3 is labeled above the base of its trunks. Specimen #2 has two main trunks, with 3-4 small trunklets as well. Specimen #3 has four main trunks and a few trunklets. This variation in the number of trunks is typical of the arborescent form of both Q. acutidens and Q. cornelius-mulleri. These leaves show quite a variation! There is no doubt that the leaves from the tree specimen superficially resemble the leaves of Q. engelmannii. That, combined with the single trunk, is the sole justification for its determination in the vouchers as "Q. engelmannii". However, leaf forms, similar to all the leaves shown above from all three specimens, are illustrated for Q. cornelius-mulleri by Fred Roberts in his delightful 1995 Illustrated Guide to The Oaks of the Southern Californian Floristic Province. 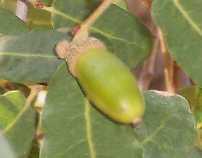 Similar leaf variation is seen in the Q. acutidens specimens at the Santa Rosa Plateau. Leaf form simply isn't 100% reliable in separating oak species; Nixon (2002) states that leaf form is highly convergent for these white oaks. In fact, oaks, as well as many other species, tend to produce leaves with lots of sharp teeth in the lower leaves, to discourage predation by browsers such as deer, and then produce leaves mostly without teeth in their upper leaves which are out of the reach of browsers. Q. chrysolepis, yet another species of oak that comes in both shrub and tree forms, is perhaps the champion for showing this variation. Leaves of its resprouting stems are so spiny that you wouldn't even consider touching them, whereas the leaves on the tree branches are almost always entire (without teeth at all). The pictures above show lower leaves from the trunklets for specimens #2 and #3; specimen #1 only has upper leaves, fitting this pattern. Fortunately, there is no need to agonize over what species these leaves look like. The leaves come stamped with a species name with their trichomes. The picture above was taken with a 5 Mpixel camera through a dissecting microscope set on his highest magnification of 35X. The picture above is at half full resolution for the camera. The bar is 1.0 mm long. The contrast has been stretched enormously in order to best show the trichomes, which makes the colors in the above picture artificial. The trichomes are a dead white to the eye under the microscope. 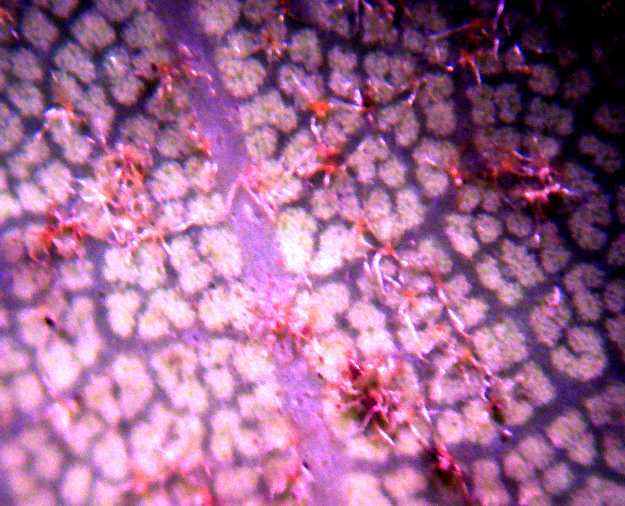 These are perfect Q. acutidens / Q. cornelius-mulleri trichomes; they are stellate with ~7-12 rays, white, and planar (Roberts 1995). The diameter (hair tip on one side to hair tip on the other side) is typically ~0.3 mm, varying from 0.2-0.4 mm, similar to the range of 0.17-0.26 mm reported by Nixon and Steele (1981) and the size shown in Roberts (1995) within the accuracy of my measurements. I've focused the microscope about halfway up the arms of the trichomes (hair branches) to try to show the strong 3-dimensional nature of the trichomes. This focus places the bottom of the arms and the top of the arms out of focus. The trichomes are clearly different in this comparison; the difference is much more dramatic under the microscope due to the color difference (white vs. brown) and flat vs. three-dimensional trichomes, as well as the size difference. The individual trichomes on specimens #2 and #3 are the same as for #1, but they are several orders of magnitude denser, which is the typical trichome density of Q. cornelius-mulleri. Specimen #1 has the typical trichome density of Q. acutidens. Q. cornelius-mulleri: voucher and Michael Charters' picture, both of which show identical acorns. Note also the shapes of the leaves in Michael's picture, some of which are very Engelmann-like in shape as well. 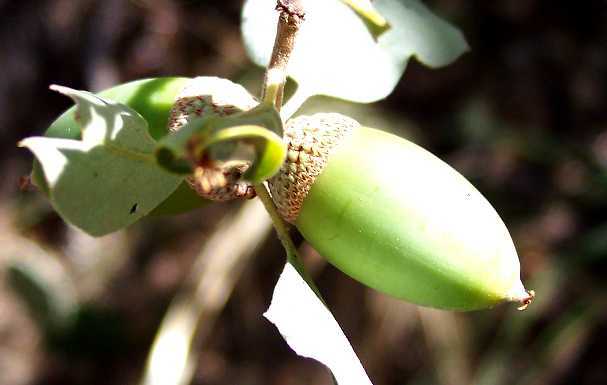 Q. engelmannii: Tom Annese's picture; illustration by National Arbor Day Foundation; Michael Charters' pictures, all of which show very different-appearing acorns. The acorn cups are 5.5-6.0 mm for specimen #1, and 5.0-5.5 mm for specimen #2, fitting the 5-8 mm length for Q. cornelius-mulleri and the 6-9 mm for Q. acutidens, and much shorter than the 8-10 mm length for Q. engelmannii. the habitat here. 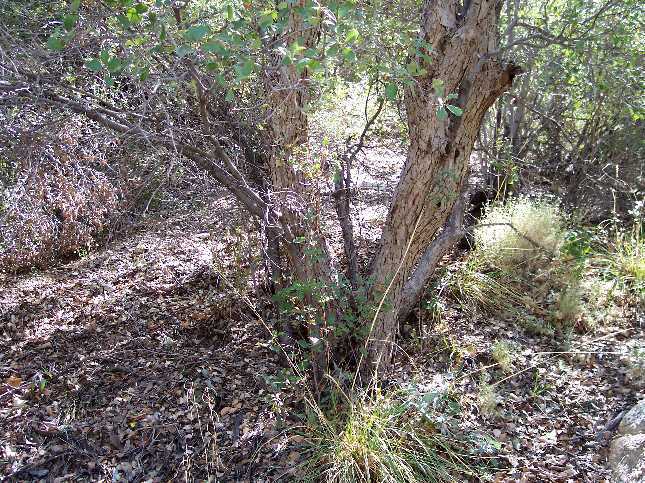 The habitat in Horsethief Creek, a sandy to rocky riparian habitat nearly devoid of soil, is very unlike the typical habitat of Q. engelmannii, flat slopes with heavy clay soil. In contrast, a determination of Q. acutidens for this tree specimen #1 fits nearly perfectly, and there are specimens close enough that it is quite reasonable that this is a member of that population. It is quite plausible that in the cooler climate 10,000 years ago that there were many Q. acutidens plants surrounding this location. Even now, birds can easily move the acorns a distance of eight miles from the population now extant. The only deviation from the description of Q. acutidens in the Jepson Manual and in Roberts is the height of the tree. The Jepson Manual gives 10 m as the maximum height of this species. I measured ~15 m, from a measured shadow length of ~15 m at local noon on 17 October 2006, when the sun angle was approximately 45°. It is not surprising that this location might produce a record height for this species, since it is the wettest location in which a specimen of this species could be found. Also, floras are notorious for not giving the full range for most characteristics; it would in fact be surprising if there were not specimens taller than the 10 m given in the Jepson Manual. Could this arborescent specimen be an F1 hybrid with another species? That possibility can be ruled out by the following. The existence of Q. acutidens / Q. cornelius-mulleri trichomes demands that one of these species be one possible parent. Oaks hybridize only within a subgenus, in this case the white oaks. There are only two white oak species that are trees, Q. engelmannii and Q. lobata, none of which is nearby, and there are no trichomes from either of these species present. Another possibility is that this specimen is, say, a fourth or fifth generation descendant of a cross between Q. cornelius-mulleri and Q. engelmannii from some distant time when specimens of that species might have been in the area. The following discussion draws largely from their input. 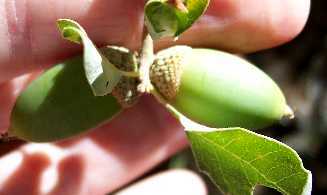 There are well-known cases where an oak species is no longer present in a given area, but some specimens appear to have genes from past hybridization with that species. 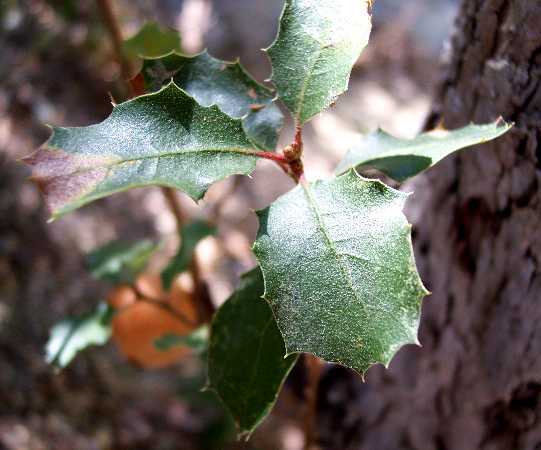 One case is the existence of apparent hybrids of Q. lobata with oaks in the San Joaquin Hills of Orange County, and with a Q. engelmannii in western Riverside County, despite the closest Q. lobata presently occurring over 70 miles to the north. 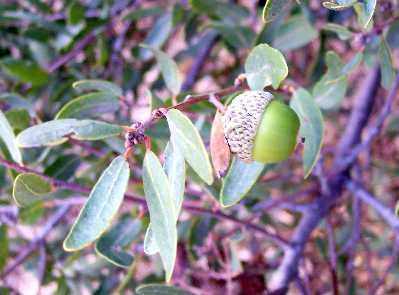 These cases are particularly clear, since both the leaves and acorns show evidence of intermediacy between the parent taxa. In this case, specimens of Q. engelmannii might have been present in this area when the climate was cooler and wetter during the glacial maxima in North America. Alternatively, native Americans might have intentionally introduced specimens of Q. engelmannii in this area. This hypothesis gets around many of the difficulties with a pure Q. engelmannii identification, since such past hybridization would not necessarily still retain Engelmann trichomes in the leaves, and no specimen of Q. engelmannii need be currently present nearby. Such hybridization nicely accounts for the tree form and the leaf shape and size of this specimen, and then can explain the sparseness of the Q. cornelius-mulleri trichomes of the leaves. Unfortunately, botanists apparently denote specimens resulting from such past hybridization with the same name specimens resulting from F1 hybrids, which is confusing. Thus under this hypothesis, the determination of this tree would be Q. cornelius-mulleri X Q. engelmannii, even though it is not an F1 hybrid. Of course, since Q. acutidens is already thought to be the product of past hybridization between these two parents, it is not clear there is any actual difference between calling this tree Q. acutidens or Q. cornelius-mulleri X Q. engelmannii. There are specimens of Q. acutidens from coastal southern California determined in herbaria as Q. cornelius-mulleri X Q. engelmannii. However, this explanation is far more tortuous than the simpler explanation that this specimen is a straightforward Q. acutidens; Occam's Razor strongly supports calling this specimen simply Q. acutidens. There are many examples of both Q. acutidens and Q. cornelius-mulleri in this area. The arborescent specimens of Q. cornelius-muller in Horsethief Creek are surrounded by literally thousands of much-shorter shrubby specimens away from the creek; clearly the water of Horsethief Creek has produced the two arborescent specimens in that location. Similarly, there are many Q. acutidens found not very far away; it is only reasonable that specimens from this species would become arborescent in this location as well. Nixon, K. C. 2002, The Oak (Quercus) Biodiversity of California and Adjacent Regions, USDA Forest Service Gen. Tech. Rep. PSW-GTR-184. Nixon, K.C. and Steele, K.P. 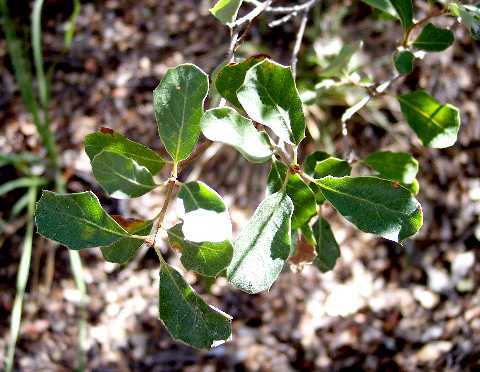 1981, A New Species of Quercus (Fagacaeae) From Southern California, Madrono 28: 210. Tucker, J.M. 1993, in The Jepson Manual: Higher Plants of California, Hickman, J.C., ed., University of California Press, Berkeley, CA.